The reason why I’m bringing this up is that Piczle Lines forced me to think about what I meant by uniqueness. 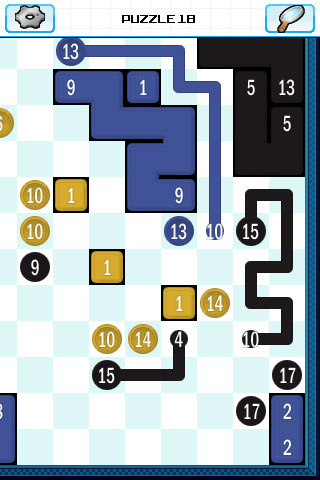 The game has you connecting numbers with paths of the same length: for example, if you have two 9’s, then you connect them with a path of length 9. Also, each number has a color, and you can only connect numbers with the same color. Given that, the strongest form of uniqueness would be that there is a unique set of legal paths connecting the numbers. That turns out to be too strong, though. Say that you’ve got a 3×3 square with 9s in the upper left and lower right. 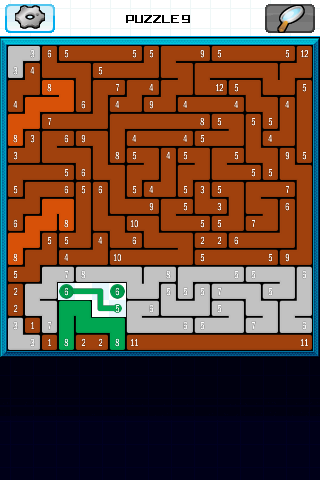 Then you can fill that square with paths going up and down or paths going right and left; and, it turns out, choices like that show up all the time in Piczle Lines puzzles. While it’s possible to come up with puzzles that have a unique solution under this definition I also suspect that such a constraint would be excessively limiting. I was going to say that the puzzles working under such a constraint would be too easy, but, actually, Numberlink does have that constraint, and my memory is that Numberlink puzzles are plenty difficult. (Incidentally, don’t be misled by the use of numbers in that puzzle, they have a completely different meaning than the numbers in Piczle Lines , but both puzzle types share other core concepts.) Still, it’s a constraint that I don’t think is inherently beneficial; I certainly enjoyed Piczle Lines more than Numberlink, though I’m now planning to revisit the Numberlink book I have. But it’s not the only possible definition of a unique solution. The next level of uniqueness would be that there’s a unique way of pairing up the numbers, and that the regions traced out by the paths is unique. (So, returning to the example above, that those numbers would always be linked through a path tracing out the same 3×3 square.) This also turns out not to be the solution that Piczle Lines chose: fairly frequently, you’d find a decent-sized region with two pairs of numbers that could divide up a given chunk of space in multiple ways. Again, you could probably design puzzles using this form of uniqueness (though I don’t have a good feel for how that would turn out), but it’s not what we see here. The weakest form of uniqueness uses the colors. Piczle Lines puzzles aren’t abstract puzzles, they’re drawing a picture, so maybe all solutions to the puzzle end up drawing the same color regions? For a while, I thought that this was what the game meant by uniqueness, because most of the puzzles do have a unique solution in this regard, but eventually I ran across a puzzle where you could trace out one region of the border between colors in two different ways. Still, such examples were relatively rare, and my tentative opinion is that they’re a bug: if the idea behind the puzzle is that we’re trying to make a picture, then puzzles should pin down the picture that they’re making. My confusion about what uniqueness meant in the context of the puzzle solutions was mirrored by confusion about tactics to use. One of the quirks of the puzzles is that it was possible to leave squares blank: most puzzles filled up the entire board, but not all of them. This has an effect on how you can reason: if a corner square is filled up, for example, then there’s only one way for a line to enter and leave the corner, but what if the corner is blank? This same sort of calculation was also theoretically possible for smaller areas of the puzzle: perhaps there would be an area of the puzzle where you had filled out all of the boundary except for one area. Then, by calculating, you could at least figure out how much the boundary in that area extended into the surrounding region (or, conversely, how much the surrounding region pushed back into the area in question); sometimes, that knowledge alone was enough to uniquely determine where that boundary was located. What makes this last sort of example different is that adding up the numbers inside to calculate how the boundary was shaped really could be useful. (In contrast to the whole-puzzle situation, where it’s confirming something you were almost positive was the case anyways.) I didn’t actually go to the trouble of carrying out the calculation (or at least I rarely did), but it added some real pacing to the structure of solving the puzzle: I’d get nervous if I had a large area and then would feel relieved when I got to where I understood exactly where the boundary to that region had to go. So, in two different ways, the game managed to present me with a fair amount of uncertainty (what uniqueness meant, what the results of adding up the numbers in a region of the puzzle would be) in a way that still had some scaffolding for my desire for proof to cling to (my hypotheses of uniqueness, how I would use the result of adding if I were to carry out the exercise). And at least partly because of this, the game did quite a bit towards allowing me to push towards solutions that I couldn’t prove were unique. I’d trace out lines that seemed to make sense (but not connecting them all the way, to give me a reminder that I hadn’t proved their validity); and, once I got to a choke point for a region and could prove that the boundary had to look a certain way, being able to connect a half-dozen of uncertain lines at once felt great! The business model for the game is a free initial download with subsequent downloadable puzzle packs available for purchase; and, in fact, one of the download packs is free. (They’ve since released another free one.) And the download packs are very cheap: you can get quick a lot of puzzles for a buck. And, once I’d finished those, I’d gotten more than enough pleasure out of the game to immediately buy the rest of the DLC. Who knows what the right set of price points is for this sort of content (and, if the developers are reading, I’d be happy to buy more DLC, especially if it consisted of large puzzles! ), but it makes me happy that a free product that narrative hooks, free DLC to get you started, and a crystal-clear value proposition (the hardest puzzles would easily take me a half-hour or more to solve while costing just over one cent each) can lead to a good conversion rate. I just hope that the total sales are enough to keep them going! Hmm, can you post two screencaps showing two different solutions (in that strongest sense of uniqueness)? Link-a-Pix (http://www.conceptispuzzles.com/index.aspx?uri=puzzle/link-a-pix) appears to be the same thing as Piczle, and its solutions are strongly unique; sometimes it looks like there are there are multiple local possibilities, but the constraints imposed by other parts of the puzzle always end up imposing a single solution. So it’s definitely possible to make interesting puzzles that are strongly unique, and I’m curious if Piczle really doesn’t. 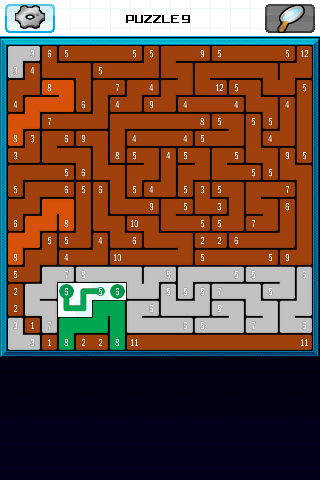 It took me a little while to find one – the smaller and easier puzzles tend to have unique solutions, it seems, but here’s an example. It’s actually an example of the second type of uniqueness failure instead of the first. OK, that definitely counts! I had a hard time believing that you would be wrong about it, but it was weird given my experience with Link-a-Pix. It seems like it should not be that hard to transform a non-uniquely-solved puzzle into a uniquely-solved one; their failure to do so seems a little disappointing. Yeah, that example is unfortunately banal. The larger examples don’t bother me as much, for whatever reason. Crossword puzzles have unique solutions. I would be surprised if you could find a different solution, even by a single letter.